From left to right: First-place winner Belen Fadrique; Runner-up and People's Choice winner Kilan C. Ashad-Bishop; and tied Third-place winners, Narciso Quidley-Rodriguez and Haley Mathis. The Graduate recognized a total of 4 winners at the 2018 Three Minute Thesis (3MT®) Competition earlier this month after a myriad of outstanding performances by doctoral students ranging from business to music and more. First-place winner Belen Fadrique, Biology Ph.D. student, took the coveted 3MT® cup to the biology department in the College of Arts and Sciences with a three-minute version of her dissertation Forest Dynamics in the Andes-Amazon Region: Distribution of Native Woody Bamboo and its Effect on Ecology and Physiology. 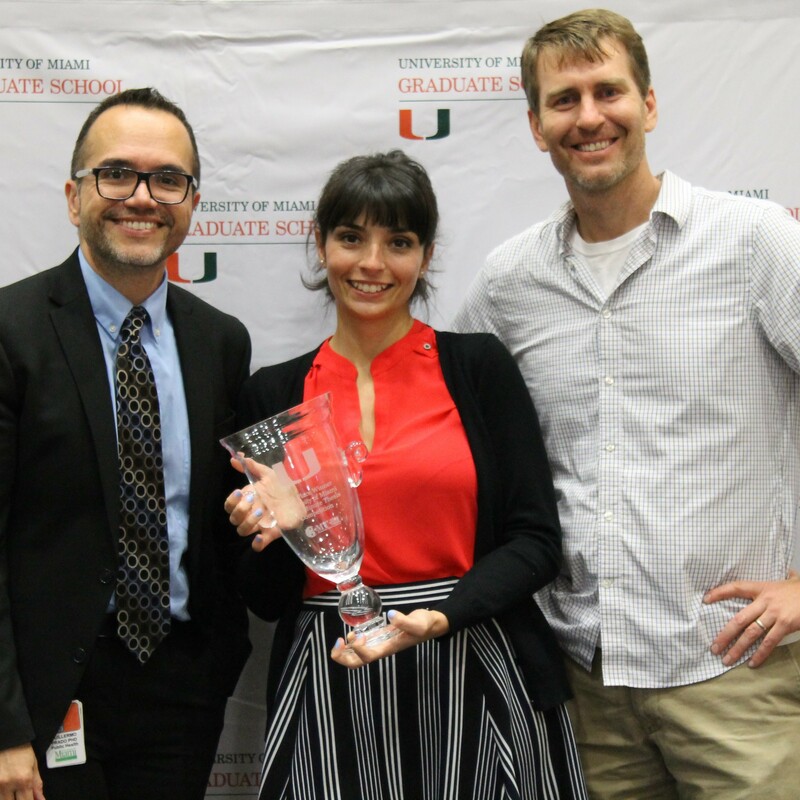 Belen will go on to compete the statewide Three Minute Thesis Competition at the 2018 Conference of Florida Graduate Schools in Tallahassee on April 20th. Cancer Biology Ph.D. student Kilan C. Ashad-Bishop won both the Runner-up and People's Choice awards with her dissertation The Role of LBH in Promoting Basal-Like Breast Cancer. Third-place was a tie between Ph.D. students Narciso Quidley-Rodriguez from the School of Nursing and Health Studies, and Haley Mathis from the philosophy department in the College of Arts and Sciences. Haley’s dissertation focused on Care Ethics: Morality Without Responsibility, while Narciso’s was on Sexual Decision-Making among Men who Identify as Bears. The winners were selected by an interdisciplinary panel of judges consisting of distinguished UM faculty members: Dr. John Bixby, Vice Provost for Research and Professor of Pharmacology and Neurological Surgery; Dr. Tim Watson, Chair and Associate Professor of the English Department; Dr. Isaac Prilleltensky, Vice Provost for Institutional Culture and Professor of Educational and Psychological Studies; and Dr. Charles Eckman, Dean of Libraries and University Librarian. This year’s 3MT® Competition was part of Graduate Research across Disciplines (GRaD) Day, which was dedicated to promoting interdisciplinary exchange and collaboration. 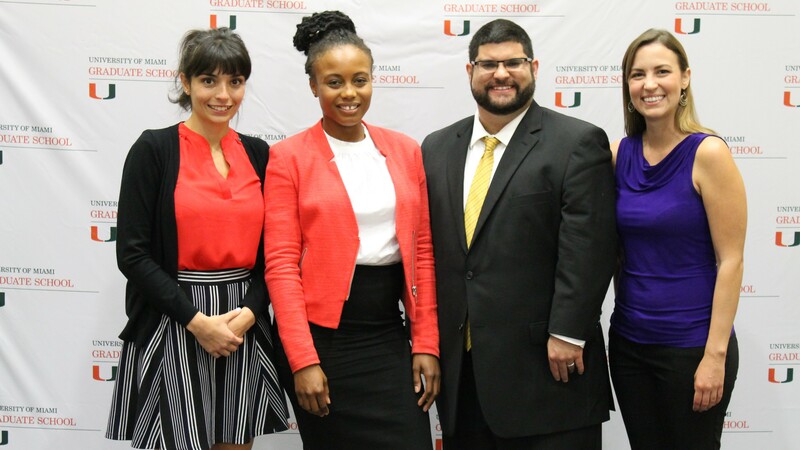 The awards ceremony for the 3MT® Competition included the announcement of the winners from Graduate Student Research Symposium held earlier that day, who will also present their research at the 2018 Conference of Florida Graduate Schools. For pictures of the 2018 3MT® Competition click here. To view the full recording of the competition, click here.